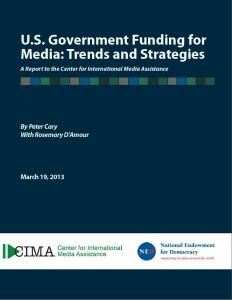 CIMA announces the release of its most recent report, U.S. Government Funding for Media: Trends and Strategies, by veteran journalist Peter Cary and CIMA’s project coordinator for research Rosemary D’Amour. It is based on an in-depth examination of proposals for media development projects put forward by USAID and the U.S. Department of State and of annual regional and global funding totals for media freedom and freedom of information provided by the State Department. It tracks the amount of funding being made available and analyzes the types of media development projects receiving U.S. government support from 2008 through 2012.